Its been almost four years since I became a Toastmaster and the journey has been amazing so far. Thanks to the awesome people who I make friends with and work together, the ones who mentor me on my strengths and weakness and every new Toastmasters who walk in to the club with something to share. 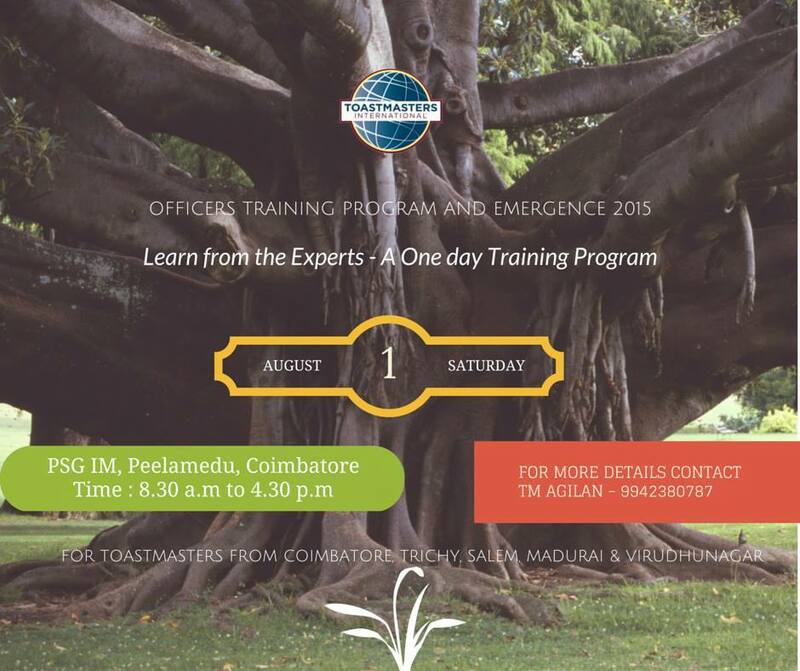 For the first time, we are having an Officers Training Program and Emergence 2015 @ Coimbatore. The best part is it is not just for Coimbatore but it is for Coimbatore, Trichy, Madurai, Salem and Virudhunagar. Its an excellent initiative from the District 82 to extend their support and mentoring to the remote clubs and we have grabbed it with all our hands. We have District officers coming in from Chennai, trained Trainers who will take us through the roles and responsibilities of the office bearers. Coimbatore is known for its hospitality, weather, water, Mysurpa ( I can add on ) but very soon, it will also be known for Toastmasters movement helping people become better leaders and communicators. We cordially invite all the Toastmasters to experience Coimbatore, learn, share and network with the like minded folks around because at Toastmasters, you will find the chosen few destined to be your friends or partners in crime. There are so many examples. So what do we have in store? Also inviting my co Area Directors from Division G – TM Sunil Baffna, TM Lavanya Adapala, TM Jerald, TM Vejey Subash and our beloved Division Director of Division G TM Vikram Nagaraj. Also gracing the event is TM Pravin Mani, Division Director of Division D. Special welcome to Toastmasters Leadership Institute’s chair – DTM Guruprasad. Also a big battalion of Toastmasters from our very own Trichy headed by the Area Director TM Mythily Ramanan. Trichy is making waves in Toastmastering currently. And drumrolls please – Presenting to you the youngest ever District Director of Toastmasters International – District 82 Director DTM Sastharam Ravendran.